WHEREAS THE PROPORTION OF COARSE W'OLS BAS SMALL. uses also will be large. 1939; except for 1935 it was larger than for any recent year. materially and any advance from present levels is likely to-be moderate. stocks held in this country on December 31 totaled 193 million pounds. but were much smaller than December 31 stocks in the years 1935-38. 1939 and were the largest since 1923, when imports totaled 266 million pounds. Imports of carpet wool in 1940: were slightly smaller than in 1939. January. United States buyers continued to purchase most of the wool sold. to the western n States, where contracting of the 1941 clip is now'under way. As yet, there is little information concerning prices for new clip wool. cents a pound higher than a year earlier. 28.1 cents on January 15, .1940. December 31 stocks in the years 1935-38.
: millionn pounds Million pounds. 1935 : 239 ......" .29 . 1938 : '2S 244 ." Compiled from Wool Stocks Reports, Bureau of the Census. a grease basis in table 2 at end of report. S1,000 lb. 1,000 lb. 1,000 Ib. since 1923, when imports totaled. 266 million pounds. .
civilian uses -was smaller in 1940 than in 1939.
the quantity imported does not change greatly from year to year. Compiled from reports of the Bureau -of Foreign and Domestic Comnrerce. than a year earlier and was the largest December consumption on record. basis totaled 630 million pounds. shipnDnts in 1940 compared with only 14 percent in 1934-38.
neutral continentall Eur'opean countries'from.October through December 1940. Africa will be purchased by the British Governmeni for the duration of the war. part the manufacture -of materials for large Army contracts. to 20 percent in domestic wool prices. 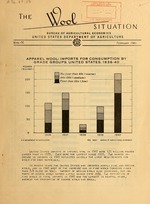 United States imports of apparel wool were large in. about 45 million pounds a month. larger than in 1940, with most of the increase in the first half of the year. in the first half of 1941. .
permit a program of long-time planning for future demands. time the merchandise is needed." but delivery will be permitted over a period of at least 6 to 10 months. get the maximum benefit of any market condition created by these purchases." ed to a considerable extent by prices of foreign wool. Subject to revision on the basis of the 1939 Census of manufactures. :1,000 lb. 1.000 lb. 1,QO0 lb. 1,o00 lb. 1 OC lb. 1. 000 lb. 1,000 b.
and afloat to all dealers, manufacturers and topmakers in the United States. where no figures are shown. Includes carpet wool afloat to the United States. by the Bureau of the Census until June 1935. / Wool afloat not separately reported until June 1936.
ription 198 9 : 1940 : 1939 1/: Jan. : Dec. : Jan.
1/ Highest monthly average price. Before payment of duty. Compiled from the Boston -Commercial Bulletin. 4/ Scoured basis, Boston market. / Average at 10 markets. Hew series, 15/16" in place of 7/8" previously quoted. /White, 13-15 denier, at New York, Bureau of Labor Statistics. / Domestic yarn, first quality, Bureau of Labor Statistics. / F.o.b. producing plants, Bureau of Labor Statistics. : Nov. : Dec. : Nov. : Dec.
condition received from pulleries and is mostly washed. : Yepr beginning : Oct.-D:-c.
: 1,000 !b. 1,000 lb. 1,000 Ib. 1,000 lb. 1,000 Ib. : 1,000 lb. 1,000 lb.